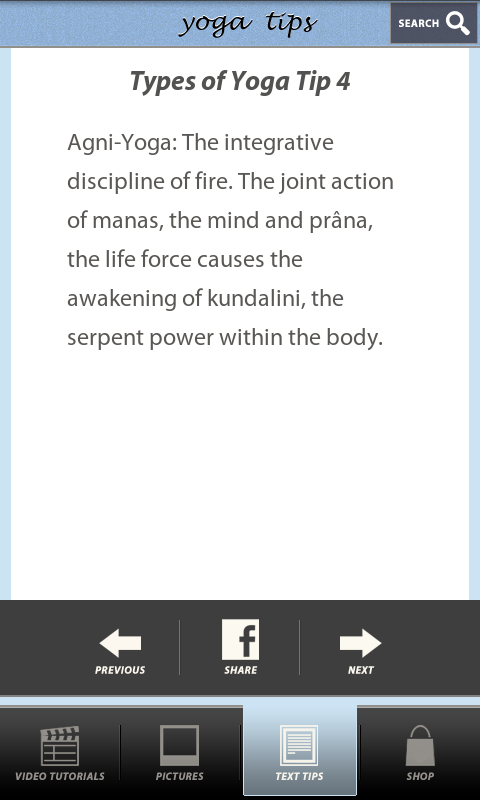 Master yoga poses and yoga meditation with “Yoga Tips Pro” app! Discover different types of yoga and learn how to practice yoga at home, improve your health and connect with your spirituality! -	More than 200 tips on how to do yoga! -	Discover the history of yoga and meanings of basic yoga terms! -	More than 380 yoga videos showing how to do yoga asanas! -	Over 450 yoga pictures-different yoga postures! -	Find out which yoga equipment you can use to get the maximum benefits out of yoga positions! Discover what is yoga and why yoga has so much physical and mental benefits! Learn yoga basics and yoga poses for beginners without going to some expensive yoga studio! Yoga for beginners includes easy yoga poses which can be mastered by beginners and without taking yoga classes! Using yoga for weight loss is the healthy way to lose weight and experience all the yoga benefits! Different yoga techniques and yoga workouts help lean muscle and get nice sculpted body!